Embarking on a new web analytics project calls for careful planning and a sound strategy. You need to define precisely what you want to achieve with your project. One of the key components of this process is gathering business requirements. That will serve as a detailed road map to ensure you’re heading in the right direction. Complete documentation ensures that all parties involved are on the same page and supports smooth decision making. When you set your mind on such a project, be aware that you might be setting off down a bumpy road. To help you out, we’ve decided to provide you with some specific recommendations and practical tips for you to get maximum value from web analytics. So, off we go! What are the objectives you want to achieve? What users’ needs do you want to meet? How will your new website/app/feature etc. bring more value to your customers? What’s more, in the process of gathering requirements it’s vital to devote time to creating and implementing the right reports, ones that reflect stakeholders’ expectations. A common problem among organizations is that they neglect the whole process or do it incorrectly. And what’s the cost of such mistakes? Wasted resources and no idea whether your web analytics project is providing any ROI. That’s why it’s crucial to have a good strategy in place. Also, keep in mind that the process of gathering requirements should be documented. It’s a formal agreement between the customer/end users, the stakeholder and the project manager. It ensures all parties involved are on the same page throughout the whole project and know what to expect from the final product. To help you grasp the complexity of this process, we’ve broken it down into smaller steps to make it less overwhelming and easier to implement. Before you move on to collecting requirements, you should learn who will be taking part in the process. This will give you a better understanding of the stakeholder community and its role in the whole project. Ultimately, it will be much easier to understand all the issues and goals this undertaking needs to address. Also, since there can be some hidden stakeholders in your project, it’s good to use initial meetings to ask some probing questions to figure out who your real users are. Their input is crucial to ensuring the success of your product. The Money Person: a CEO or C-level Manager. A single person with the final word on project approval. The Coach: Marketing Manager or Consultant. A person with significant impact on internal stakeholders, who sets policies and the agenda. The IT Person: Software Engineer. A person responsible for providing you with screens and solutions, and who also ensures compatibility and that technical standards are met. Once you’ve built a list of people involved you can proceed to gathering requirements. Each has its role to play and you can successfully combine them to get the required information. One of the most efficient and effective tools in web analytics projects is a questionnaire for collecting business requirements. The checklist form makes it more productive and convenient, plus it works well for both you and your customer. However, before you provide stakeholders with the questionnaire, make sure they know the goals and KPIs framework concerning the project. The categories and business questions will vary as they depend on the digital assets you need to measure. You could have a more generic form, or one specially designed for each stakeholder group. All in all, the questions and the form as a whole should mirror one of the web analytics frameworks that you’re going to work on. Do you want to measure traffic on your website including or excluding internal traffic? Do you want to exclude irrelevant Query URL parameters? Is your website set up on one or between two or more domains? Is there more than one source of traffic on your website? Do you perform any form of marketing campaigns (newsletters, emails, social media campaigns)? Are there any downloadable marketing materials on your website (e-book, whitepaper, tutorials, presentations, albums)? Do you have any blog/help center/articles on your website? Does your website have a site search you would like to track? Those are more detailed questions, used when you know a bit about your customer, maybe thanks to research you’ve done or some initial inquiries. What are the main business objectives of your website? What’s the demography of your target audience? You can use those examples as guidance, since every project is different and you need to ensure a certain flexibility and tailor your questionnaire to a particular web analytics framework. Gathering requirements is an intricate process and it’s easy to overlook something. To ensure you keep good track of everything and record all the relevant information, you should prepare a Business Requirement Document (BRD). This is a formal document that includes all the details of the project. It focuses on the needs and expectations of the customer and specifies what the business wants to achieve. It should also cover how to meet the requirements. The document should be written clearly. It should assure transparency and understanding of the requirements, leaving no room for doubt or misinterpretation. Once it’s approved by the customer and web analytics consultant running the project, you can move on to the next step, that is categorizing. customer life cycle stage, etc. The method you choose depends on the web analytics framework you’re work within. Put yourself in their (business users) shoes and lead them into data collection conversation with some guidance. I recommend the approach of breaking your measurement requirements down into categories that can be addressed one at a time. The table below depicts some requirement categories and corresponding questions that would be useful for a business user. The process of gathering requirements is no picnic. Facing challenges and dealing with flaws is part and parcel of the job. We’ve got some handy tips you can follow to make your web analytics project run smoother. Accept that it’s impossible to achieve 100% accuracy of captured requirements. There’s always room for human error, a principle that applies to any project. Don’t assume you know the customer’s needs. Always ask about them and ask why. Document your meetings. There’s a chance you might miss something later on or there wasn’t enough time to talk about some issues at the session. Talk to as many people as needed to get good background, but limit the number of people involved in requirement collection meetings to keep the process well-managed and coordinated. Update your client frequently with the results of requirements gathering exercises so you can proceed with the project without a hitch. Wait to discuss technological solutions until all requirements are fully understood and accepted. At this point, you’ve got the data – more or less structured – which means you’re halfway there to putting all this information into practice. Now it’s time to map your business requirements to your website or app goals and KPIs. That’s a vital step before you can start designing an implementation or tracking plan. Keep in mind that the people involved in the project might have different skills or understandings of web analytics processes. Sometimes it takes more time and resources to elicit the KPIs and goals you need to focus on. The success of digital marketing campaigns depends on various factors like tools, creative banners, and engaging content. Fatal flaws in such endeavors include a lack of structured thinking and failure to understand the real purpose of your website, app or campaign. During the requirement capturing process you need to focus on identifying your business objectives. Start big, and think about the overall purpose. Define your expectations regarding web presence. In this case, it’s more important what you want to accomplish rather than how. Such an approach will bring you significantly closer to mapping requirements to the analytics goals and KPIs you’re targeting. Then, dig deeper. Identify the core objectives, like building awareness, generating leads or promoting events. Focus on objectives that are precise, within your reach, and which bring your business significant value now but also in the long run. The next step in the process of collecting requirements is to identify goals for every objective. This means you need to clearly establish the aims of your website or of a particular campaign. Goals serve as distinct methods you apply to reach your business objectives. At this stage you should be able to map business goals to different areas of web analytics. And by areas we mean building awareness, lead generation and highlighting events. 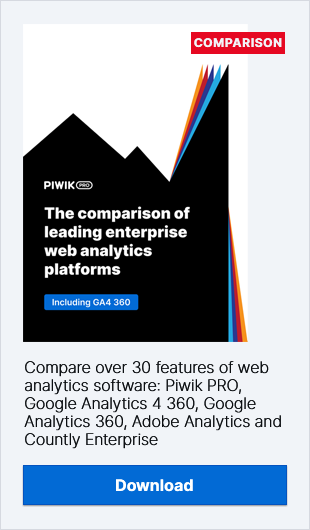 These domains depend on the web analytics framework you establish. Goals and objectives are closely linked. Your task is to precisely define both to make sure you accomplish them with as little fuss as possible. In the world of digital analytics there’s an unfortunate tendency to measure absolutely everything. That method can prevent you from reaching your objectives. The risk is that you’ll drown in a sea of data and easily miss what’s crucial, e.g. business users’ expectations. To steer clear of such situations you need to find the most relevant KPI for each business goal. This means focusing on what’s really worth measuring. So instead of measuring only clicks, visits, or emails sent you look for more specific metrics. Realize that not all KPIs are equal. Clicks or Visits are important, but they might be taking up too much of your attention. The next step in putting your requirements into action is defining targets in your marketing initiatives. Targets are numerical values which you have predetermined to measure how good or bad your website, app or campaign is performing and to track progress against target goals. So to see the results of your web analytics projects, you should define targets for all the metrics in your report. This is a key but often overlooked practice. These targets help you understand whether the numbers in your report indicate wins or loses. Let’s say you want to increase traffic by 25% with non-branded keywords in this quarter. This 25% is your target. You goal would be if you just aimed to increase traffic through non-branded keywords. With this kind of setup, everyone in your company understands the direction you’re going in. Once the business requirements are captured and you’ve managed to transform them into KPIs, objectives, goals and targets, you need to record all the results in one final document. You could make it a part of your BRD or create it as a separate piece. Still, it should be shared among stakeholders for their approval before you proceed to the next step in your analytics project. Once requirements have been solicited from all stakeholders and you have a complete list, you should validate whether the process of collecting requirements has been done properly. In other words, you should check if everyone involved understood the requirements and if they were successfully translated into appropriate goals, objectives and KPIs. Collecting and verifying business requirements is no easy feat. It’s time consuming, complex, and requires a lot of effort. Also, just like any other business project, it’s fluid. Some things will change in the course of the project, priorities will shift, your stakeholders might forget to mention something, and so on. That’s why you need to stay alert and continually document all arrangements and inputs. We hope that our practical advice will help you get through this requirements gathering process with less effort and will lead to the most optimal solutions to your web analytics problems.